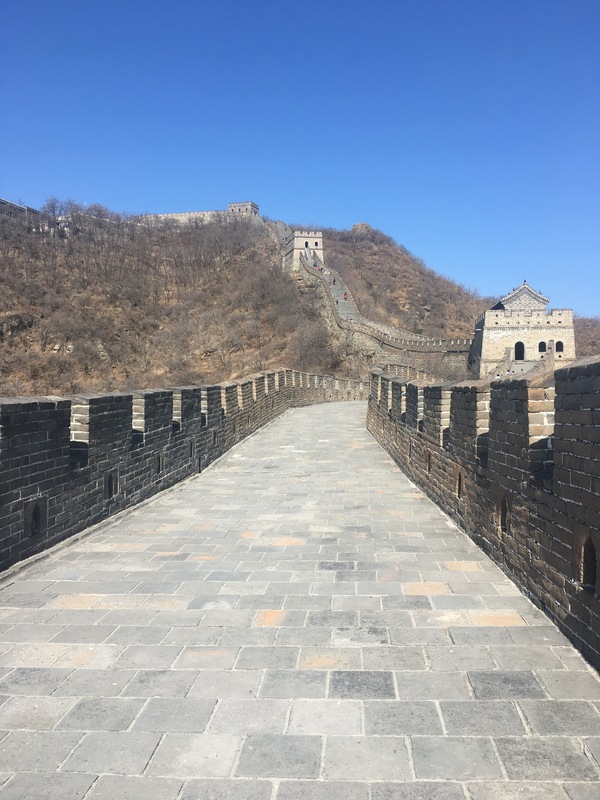 While our group opted to go explore the Forbidden City (which we had already done) we went to cross a few more items of our must see list. 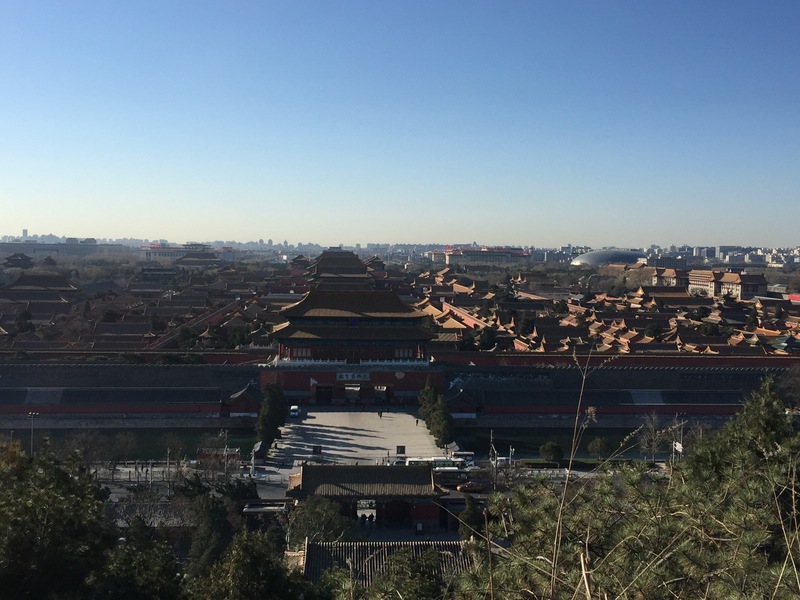 First stop, was a man made mountain that overlooked the Forbidden City and Beijing in general. The park was a 15 minute walk from our hotel and a cheap to enter. Elderly Chinese were everywhere in the park practicing Ti-Chi in the early morning sun. We climbed the steps and snapped the views of the city from above. The circular temple at the top offered 360 degree views and was definitely worth the visit. Next we strolled down and wandered down the busy roads towards the nearest metro station to Beijing Zoo. We thought that it might be our only opportunity in China to see Pandas and having both not seen them before. We are both not usually fans of zoos but made an exception. The zoo however was a disappointment. 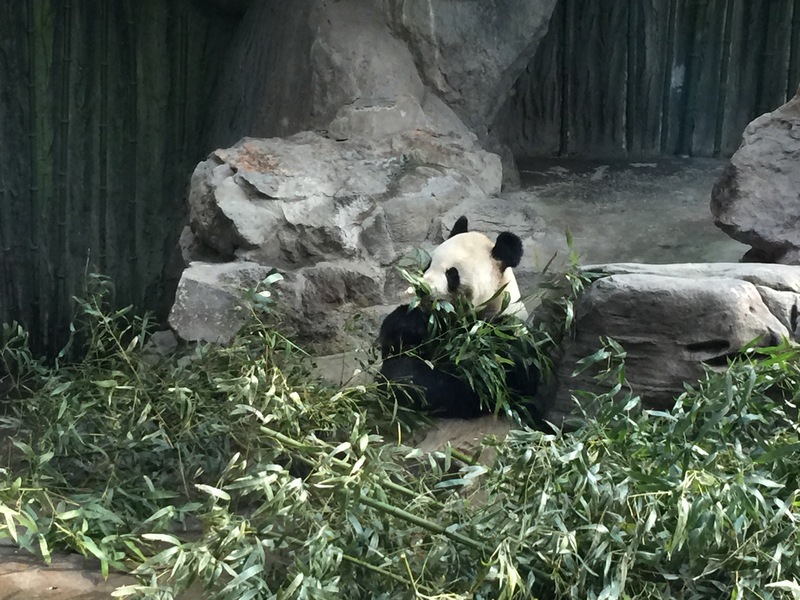 The Pandas were well fed but their enclosure was poorly maintained. The water pools were dry and much of what was in the enclosure looked broken. We were surprised especially as this being China’s national symbol and it having had a revamp for the Olympics. The other animals looked sad and depressed and likewise had poor small enclosures with no water. Even the polar bears lounges in their empty pool hoping for water. Our next stop was back to the city centre to bargain for the Chinese Dragons we had tried to get the night before. Successful this time we also hunted for some warmer clothing and some food. Bored of rice and noodles we had a pizza and headed back to the hotel. We had by now accumulated a fair few souvenirs from our travels that we wanted to send back home. We bought a box and packaged them all up ready for the UK. Our hotel had advised us that there was a post office relatively nearby so we lugged the 7kg box for 15 minutes. The staff spoke no English (like 90% of Chinese) and demanded we unpacked our neatly packed box to see what was inside. Upon inspection they decided they wouldn’t let us post it there but directed us to go to an international post office somewhere in the city. After lugging the box half way across Beijing and around several blocks we found ourselves in the diplomatic area. After some emergency use of expensive 4G we finally found the international post office. Here staff at least spoke English and understood what we wanted. We opted for the cheapest option sending it by sea, which will take 3 months!! So I better let my sister know to expect a package in June!! The post office ordeal had tired us out so we headed back for some rest and sleep as we were climbing the Great Wall again the following day. Departing early, we headed for the Mutiyanu Great Wall section. This section was further than we went previously and far more developed. Cable car, chair lift and even a slide/toboggan down! We first of all climbed what seemed like a 1000 steps to reach the wall on top of the mountain. 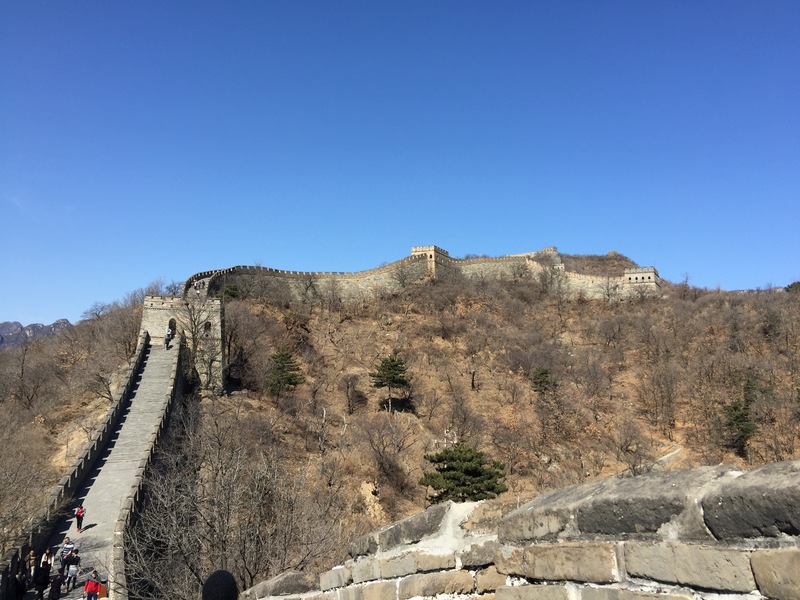 We stepped onto the Great Wall and immediately could notice that this section was wider and sloped along the mountain like the famous pictures you have seen. There were also some very steep parts as well, especially into some of the watch towers. This section of the wall was also very busy. We had climbed up and begun our trek at tower 8. We planned to walk to tower 14 were the cable car came up and back to tower 6 where we would take the toboggan down. The walk had flat and stepped sections and was mostly up hill. Many of the group struggles as they battled hangovers but we carried on. Mike stopped and flew the drone while I carried on to tower 14. There were many opportunities to stop and take breath taking photos of the wall winding its way across the mountain. At tower 14 the wall climbed steeply up the mountain and I turned round and headed back to meet Mike. We met up with others and hiked our way passed where had started and onto tower 6 where the toboggan was. Not cheap at ¥80CW each it was a fun ride however. It lasted 4 minutes and I filmed all the way. You could control the speed with a handle so you could make it as exhilarating as you liked. I flew down and Mike to a more leisurely pace. Great fun, a must do if you are there and better than walking all those steps!! We returned to our bus (after a Subway) and drove to the train station as we were taking an over night train to Xian. Security at the train station was tight. Baggage check, passport check, ticket check: it was more like an airport than a railway station. When we finally boarded the train was quite different to he Indian sleeper trains we had experienced. 6 in a compartment rather than 8; fold down chairs in the aisle and quite narrow. The beds were also fixed so no flipping the middle bunk up and down for sitting and sleeping. Chinese people talk very loudly so it seemed noisy and bustling. Especially as they walk up and down the carriage getting hot water from the boiler in each carriage (they prefer to drink hot water and tea rather than cold). We looked forward to sleep after another busy day and arriving in Xian to see the Terracotta Warriors.